The ball head support 360° rotation and up to 90° leaning, so you can adjust for the best shooting angle easily. The 1/4" screw is compatible for DSLR, ILDC, phone, action camera & etc, such as for Canon/Nikon /Sony/Panasonic, for GoPro 6/5/4/3+/3 for iPhone X/8/7/6s plus & more; The max. payload is 1.2kg. 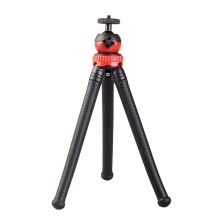 Waterproof material, so you can clean it up easily; Touch & crack-resistant structure, making the tripod stabler and more durable. Folding Height: 30cm / 12"
Package Size: 29 * 7.3 * 4.7cm / 11.4 * 2.9 * 1.8"